SEOUL, Republic of Korea - The U.S. Navy amphibious assault ship USS Bonhomme Richard (LHD 6) is engaged in search and rescue operations April 17 near the site of Korean passenger ship Sewol that sank near the island of Jindo off the southwestern coast of the Republic of Korea. The Korean passenger ship Sewol had more than 450 people embarked and was traveling from Incheon, South Korea to Jeju island at the time of the incident on the morning of April 16. "When we were alerted to the accident, we immediately diverted to the scene to render assistance," said Capt. Heidi C. Agle, commodore of U.S. Amphibious Squadron 11. "However, the efficiency of the Korean response eclipsed the immediate need for our assets. We will provide support as requested by the Korean on-scene commander." Bonhomme Richard was on a routine patrol in international waters west of the Korean peninsula at the time of the incident. The ship has been assigned a search area five to 15 nautical miles from the shipwreck site. 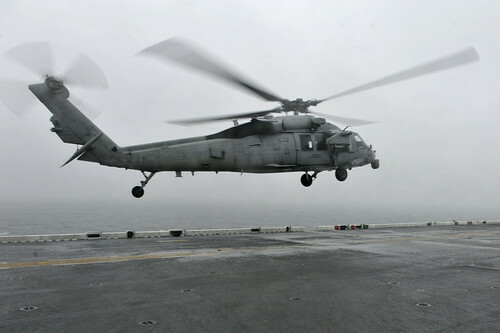 Two MH-60 Seahawk helicopters from Bonhomme Richard are conducting search and rescue operations within the assigned search area. Additionally, the U.S. and Republic of Korea navies will exchange liaison officers to facilitate communications for the search operations. "Our partners in the Republic of Korea coast guard and navy have the lead during this operation and the South Korean responders have been very efficient with their efforts," said Capt. Joey "JT" Tynch, commanding officer of Bonhomme Richard. "We remain ready to offer whatever help is required. Our thoughts and prayers remain with the passengers and crew of Sewol and their families." Bonhomme Richard is forward-deployed to Sasebo, Japan as part of the U.S. Seventh Fleet. With its embarked Marine Expeditionary Unit, Bonhomme Richard is capable of both combat and humanitarian operations. The ship's primary mission is to embark, deploy and land elements of a Marine Landing Force in amphibious assault operations by helicopter, landing craft, amphibious vehicle or any combination of these methods. Bonhomme Richard is also equipped with MV-22 Osprey tilt rotor aircraft, MH-60 Seahawk helicopters, CH-53 Sea Stallion helicopters and small boats with the capability of conducting search and rescue operations. The U.S. Seventh Fleet will continue to provide assistance to the search and rescue operation as requested by Republic of Korea rescue authorities.